Alright, I have to say this: I'm not jumping on the gluten-free bandwagon, I promise. I know a lot of people are going for this trend (I can say that, right?) voluntarily, which is something that I find head-scratchingly crazy. Give up bread ... on purpose? But, why? Okay, I get it. Lots of people claim it makes them feel better, lighter, more energized and about a million other convincing reasons that don't sound half-bad. But you know what else doesn't sound half-bad? Cake. Anyway, speaking of cake, there are actually a ton of gluten-free options out there these days that are surprisingly (I can say that, too, right?) tasty despite their lack of wheat-based flours. With the right combination of other flours, you can achieve something pretty great, and feel pretty great about eating it, too. So I'm not anti-gluten-free, don't worry. 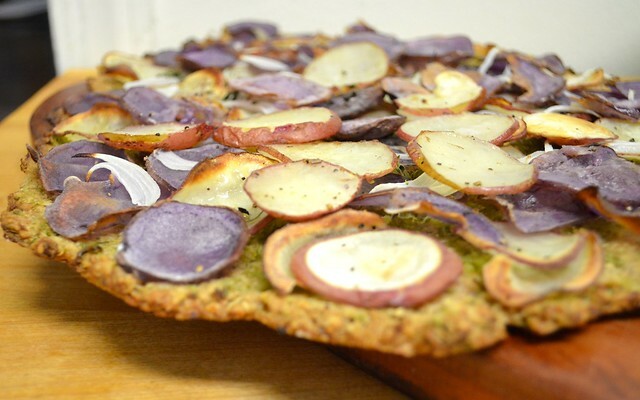 I can do it, sometimes, especially when it's as tasty as this faux-pizza from Anya Kassoff, the sometimes-raw-almost-vegan author of The Vibrant Table. One of my favorite things about Kassoff's collection of recipes is that she starts the book by explaining her affinity for food and the reasons behind her choices. It's not a justification to the reader, per say, but some background information on her journey towards health-conscious options that she genuinely enjoys. That's what I like about food: enjoyment. And when you can find foods that are equally healthy and tasty, I think that's what they call a grand slam. A home run? I don't really do sports, but you get the idea. So Kassoff is generally gluten-free (save for the occasional use of spelt flour) and gives an extensive list of different types of gluten-free flour options, their most common uses, versatilities, flavor profiles and how they are best combined. She's spelling it out for us, and I like it. She also gives a one-page plight for the pros of using sprouted flours, calling it not completely necessary but highly recommended. Noted, Anya! 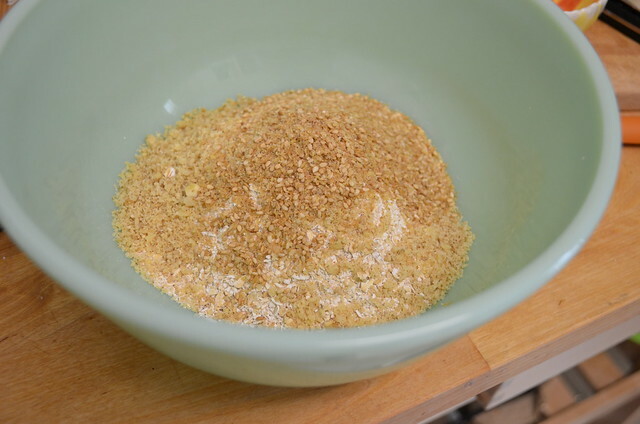 A quick note on garlic scape pesto: for this, in the bowl of a food processor I pulse 6-8 garlic scapes, 1/4 cup toasted walnuts, pinch of salt, pinch of pepper and about 1-2 tablespoons olive oil. 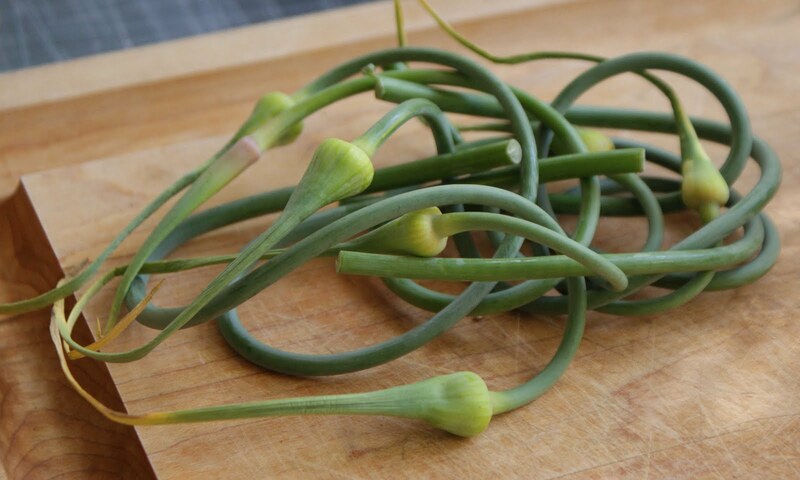 If garlic scapes are hard to come by, any herb pesto with a generous dose of garlic will do. 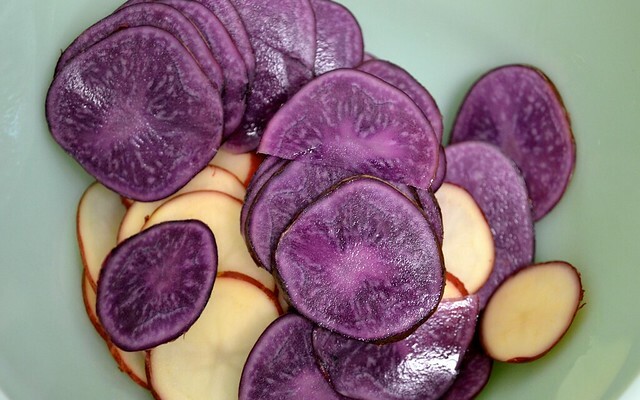 Begin by placing your potato slices in a bowl of cold water, setting aside for about an hour. 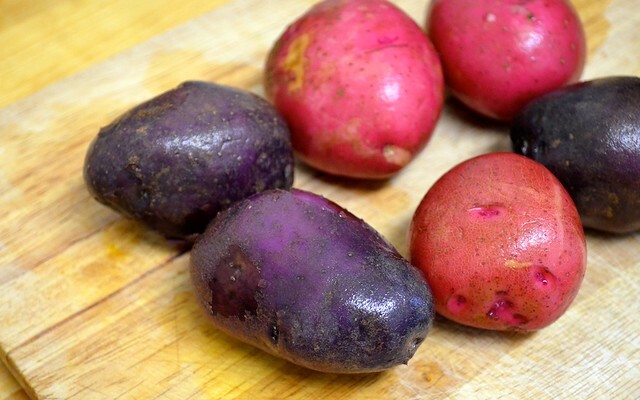 This will help remove some of the natural starchiness from the potatoes, helping them cook faster and get slightly crispy, which is the whole point of potatoes in the first place, isn't it? 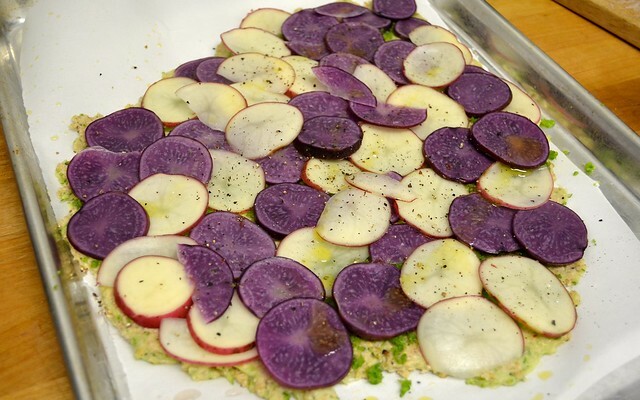 About halfway into the potato-soaking time, you can get started on the crust. Preheat your oven to 500 degrees. 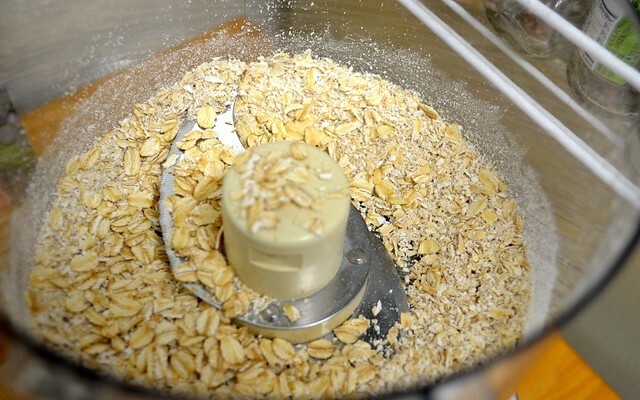 In a large bowl, combine your oat flour, walnuts, flaxseed meal, sesame seeds and salt. Add your boiling water and stir, allowing to sit for about 5 minutes so that the mixture can come together. 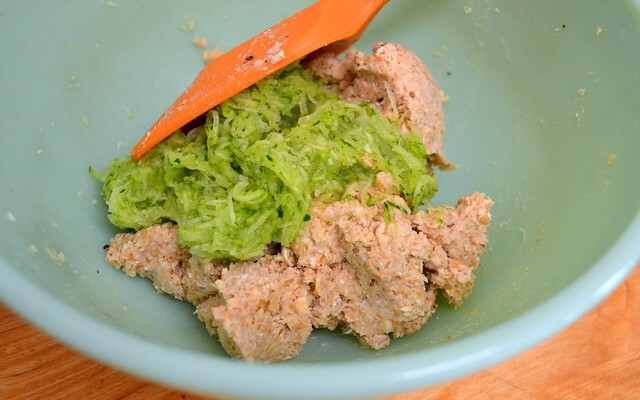 Add your olive oil and zucchini and knead together. The dough is going to seem pretty sticky right now, but that's okay. It's all part of the gluten-free journey. Place your dough on a lightly greased piece of parchment paper (a piece big enough to accommodate your crust once it's rolled out) and place a second piece of parchment on top. Using a rolling pin on top of the upper layer of parchment paper, roll your dough out until about 1/4 inch thick or 12 inches across. If your dough isn't perfectly round, don't sweat it. Weird pizza shapes denote character, which you have to have if you're making a dish like this. Drain and rinse your potatoes. Pat dry with a paper towel. 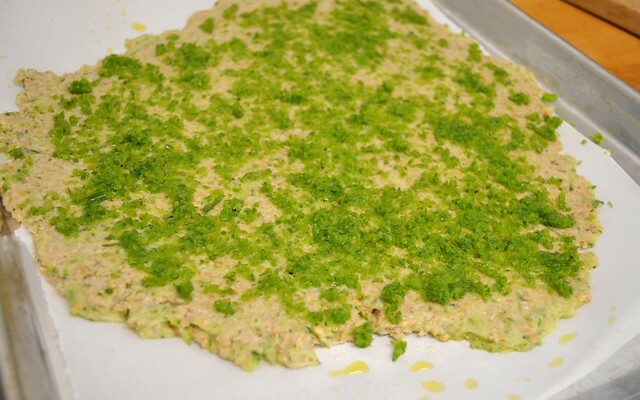 Using the back of a spoon, spread your pesto evenly onto your dough. Layer your potatoes on top, spiraling out until all the dough is covered - Anya recommends going all the way to the edges, as this dough is prone to burning if too exposed. Brush with olive oil and sprinkle salt and pepper on top. Transfer to the oven for about 20 minutes. 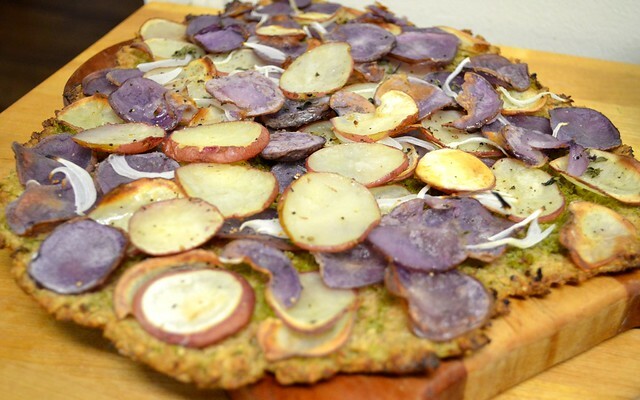 Remove from the oven and add your onion and oregano. Put it back in the oven for another 10 minutes, or until the crust has browned along the edges. Allow to cool for about five minutes before serving. Now, this might not taste like the tried-and-true pizza you've grown up loving (let's face it, we all do), but it's delightfully tasty all in it's own way. 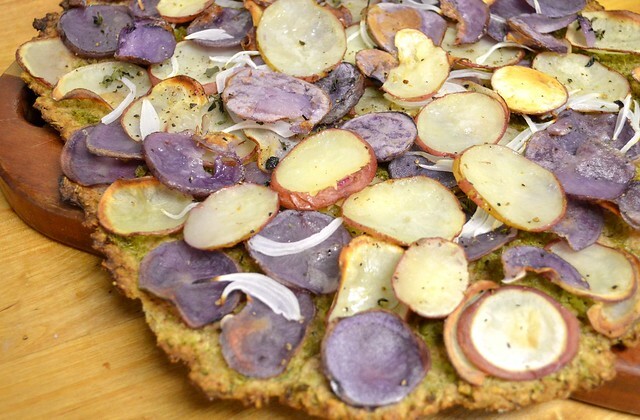 The crust is magically light and tender and the salty crispness of the potatoes are the perfect balance to the bite of the fresh herbs and onion. A standout gluten-free win.